AKG N90Q review | What Hi-Fi? Celebrity endorsement for a product is nothing unusual and generally it carries little weight with us. But, when that celebrity happens to be Quincy Jones – one of the greatest producers of all time and the winner of no less than 27 Grammys – we take a bit more notice. The question is whether the N90Qs are good enough to justify the marketing connection. First impressions are positive. These headphones come very well packed. You get a neatly made metal box, a battery pack to top up the N90Q’s internal power reserves along with a classy leather carrying case and a choice of cables and adaptors. The first thing that strikes us when we take the N90Qs out of their packaging is their colour. They’re gold on black, but fortunately don’t look anywhere near as garish in the metal as that suggests. 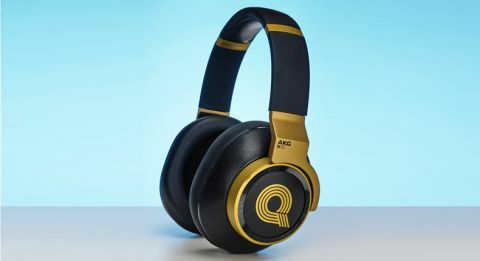 Don’t worry, AKG also make an all-black version for those who crave a little more visual subtlety. Just as AKG’s heritage and the price point demands, these headphones are beautifully made and finished. The use of quality leather, superbly machined aluminium and sensible design has resulted in a classy pair of headphones that feel like they’re worth every penny of that hefty price. They’re relatively large, and despite a weight of 460g, sit comfortably. That impression doesn’t change with extended use, though some of our test team did feel their ears get slightly too warm as time went on. Still, the AKG’s dual-density memory foam ear pads are nicely judged, as is the inward pressure that high enough to ensure a secure fit but not so high as to make your head feel like it’s in a vice. It’s all nicely engineered and exudes an aura of quality. There’s plenty of technology here too. Alongside conventional features such as noise cancelling AKG has added a built-in DAC, a set-up function to optimise the sound for your ears as well various sound modes to fine-tune the presentation to your tastes. The DAC comes into play when you use the micro USB input. Just connect the supplied USB cable to your digital source and off you go. It makes for a neat solution that (in theory at least) does away with need for a quality outboard DAC, simplifying the system at a stroke. The digital module’s resolution limit is a slightly disappointing 24-bit/96kHz, though. We would have liked to have 24-bit/192kHz at least, given the high-end level these headphones are pitched at, and the wide availability of such material. We’re used to automated set-up systems in home cinema products but finding such a feature in headphones is unusual. Simply press the little round gold button next to the power switch for around five seconds and you’ll hear a couple of frequency sweeps. The N90Qs measure your ear cavity and adjust the sound accordingly. The whole process takes a matter of seconds and seems to work, with the sound becoming more even and precise after the procedure is completed. The sound modes are worth playing with. There’s a choice of three: Surround, Standard and Studio. Surround works surprisingly well with certain recordings, giving a sense of scale and space that escapes the alternatives, but we found ourselves using Standard – its presentation is more organic than the rather dry sounding studio option, and has a sense of purity Surround can’t match. If that’s not enough adjustability the N90Q also has three tone settings – changed by a rotary dial on the left earpad – allowing emphasis to be placed at either frequency extreme if desired. Perhaps unsurprisingly, we preferred the balanced, middle option. We think AKG could have designed a better way of identifying each of these settings though. The headphone emits slightly different sounds when the tone and sound mode settings are switched and it’s easy to get confused between them. It would also be handy to have some sort of indicator to show when the phones are being charged too, we couldn’t see one leaving us unsure that everything was in order. While it’s tempting, we wouldn’t suggest judging these headphones straight from the box. Their sound improves notably with a few days of use, gaining natural warmth, refinement and more expressive dynamics. From the start it’s apparent that the N90Q’s noise-cancelling abilities are excellent. Once switched on, the general hubbub of our office quietens to a very low level and constant drone of our air conditioning becomes pretty much inaudible. The headphone’s well-designed structure offers a good degree of physical isolation too, helping reduce the amount of noise that gets through to the ears in the first place. All in all, full marks to AKG in these respects. Intrigued by the built-in DAC, so we connect our MacBook Air (loaded with Pure Music playback software) and play a 16-bit/44.1kHz rip of First Aid Kit’s Ghost Town. The results are pleasing on the whole. The N90Q have a clean and clear sound. Instruments and voices are rendered in a precise manner with leading and trailing edges defined clearly. Once the various sound and tonal modes are sorted out to our satisfaction the overall tonal balance is wholly convincing too; there’s no undue emphasis here, and the whole frequency range from low bass upwards gels seamlessly in both level and character. This kind of consistency isn’t as common as it should be thanks to the massive impact of Beats headphones, which have actively promoted unnaturally high bass levels. The group’s vocals come through with purity too, and are delivered with impressive articulation and a great deal of finesse. There’s fine organisation and the ability to keep low-level details obvious even when louder sounds come into the mix. After having a careful listen we begin to be a little concerned that the AKGs underplay the excitement and drive in a piece of music. Listening to OutKast’s Hey Ya! shows that to be true, though not to a particularly large degree. There’s speed here and a great deal of agility, but these headphones tend to take an analytical view of the music, preferring to dissect it rather than concentrate on the fun aspect. This kind of presentation may appeal to some but we place fun high up on our list of priorities. The story remains the same with higher resolution files from the likes of Taylor Swift and The Rolling Stones. We plug in Chord’s mighty Hugo into our set-up to see what the N90Qs do with a top class DAC/headphone amplification, and it comes as no surprise that the additional £1400 involved buys a notable uplift across the sonic board. We play a range of music taking in Eric Clapton, Michael Jackson and Beethoven and find these headphones at home regardless. There’s a lot of insight here, and the ability to reveals instrumental and vocal textures that quite a few alternatives would overlook. The N90Qs are quite capable of punching out huge dynamic swings while having the finesse to caress nuances. We still think they’re a little too clinical with music though. That distinctive, layered rhythm track on Billie Jean just doesn’t thunder along, as we’d like. Equally, as revealing as the dynamics are, cheaper (though non-noise cancelling) headphones such as Grado’s PS500 are just that bit more expressive in this respect. By most standards these AKGs are terrific. They’re beautifully made with high quality materials and pack in plenty of useful and unusual features. They’re hugely capable sonically, too. We haven’t come across an alternative with such a broad range of abilities, yet against this that equally huge price tag makes strong demands that the N90Qs don’t quite ace. They’re a little too straight-laced sonically to get an unreserved recommendation.